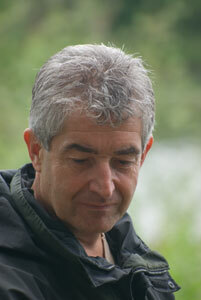 On Tuesday, Tony Juniper, Director of Friends of the Earth and a leading international environmentalist, paid a visit to the Radley Lakes to see for himself the destruction being wreaked on the area by the dumping of pulverised fuel ash (PFA) from the coal-fired power station at Didcot. Mr Juniper has fond memories of the Radley Lakes from 30 years ago when he regularly visited them as a child. He was dismayed at the destruction of so many once beautiful lakes and accused RWE npower of hypocrisy in claiming to be environmentally conscientious and yet willing to commit an act of environmental vandalism and desecration by destroying Thrupp Lake. 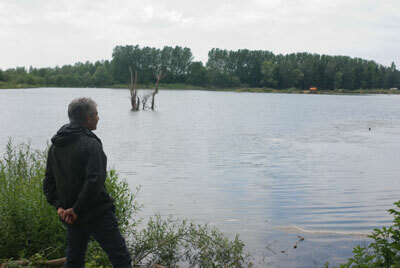 In January this year, RWE npower, who operate the Didcot power stations, received planning permission from Oxfordshire County Council to dump waste pulverised fuel ash into a 10 hectare lake, a naturally restored gravel pit, at Radley, much to the dismay of the local community who fervently wish to preserve the remaining lakes for their, beauty, their amenity value and their profuse wildlife. [See News Story] Since then, the campaign to save the lakes, now in its third year, has continued unabated and is receiving more and more support from various quarters. Today it was Tony Juniper, internationally recognised environmentalist and Director of Friends of the Earth, who offered his support to the campaign to save the lakes and to promote less damaging and more sustainable ways of disposing of waste ash. He condemned the power station operators for their lazy and careless attitude to the problem. He called upon Oxfordshire County Council to revoke the planning consent, and for local bodies to look hard at how The Lakes could be turned into a nature park for future generations. An application to have the two threatened lakes declared a Town Green, under the 1965 Commons Registration Act, is currently underway. [See News Story] The Public Inquiry to determine this resumes on Wednesday 20th June, at Radley College . If this is successful, RWE npower will be forced to find other, hopefully environmentally less damaging, ways of disposing of the ash. If not, the fate of The Lakes is firmly in the hands of RWE npower, unless Government feels able to take responsibility for, and to remedy, the situation.